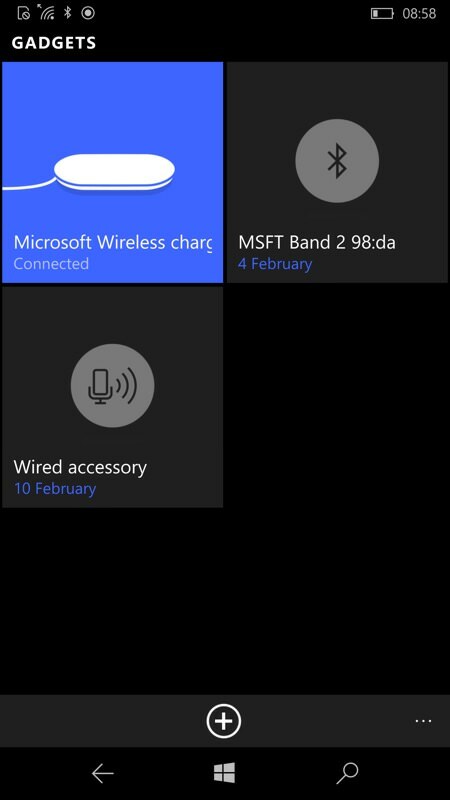 Qi chargers are pretty common these days, but Microsoft has upped the stakes with this, the DT-904, throwing in NFC and software tricks when used with a Windows Phone or Windows 10 Mobile device, alerting you of notifications for just about any applications you choose with a pleasant ring of white LEDs. After a few teething troubles with the Bluetooth pairing, this was almost the perfect Qi charging plate, not least because its charging coils extend over a larger area than on most competing products, so you don't have to be too fussy when positioning your phone. 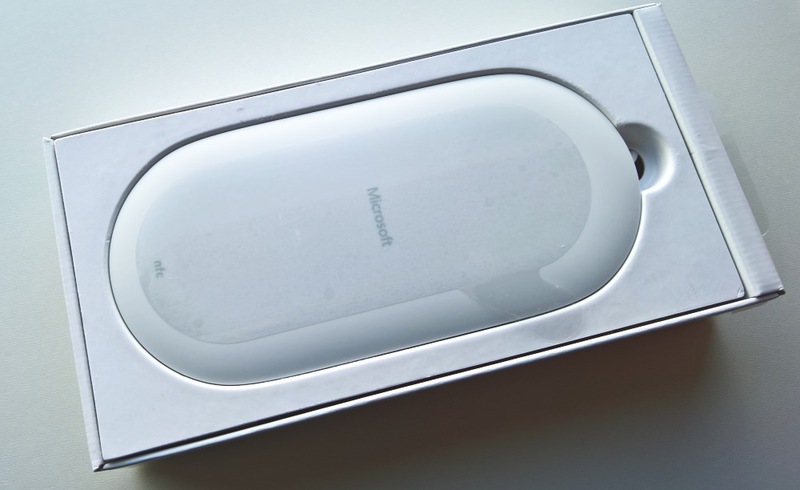 The size of the box gives a clue as to the charger's size - it measures just over 6" from end to end, with a rounded form that's pleasant to look at and to hold. 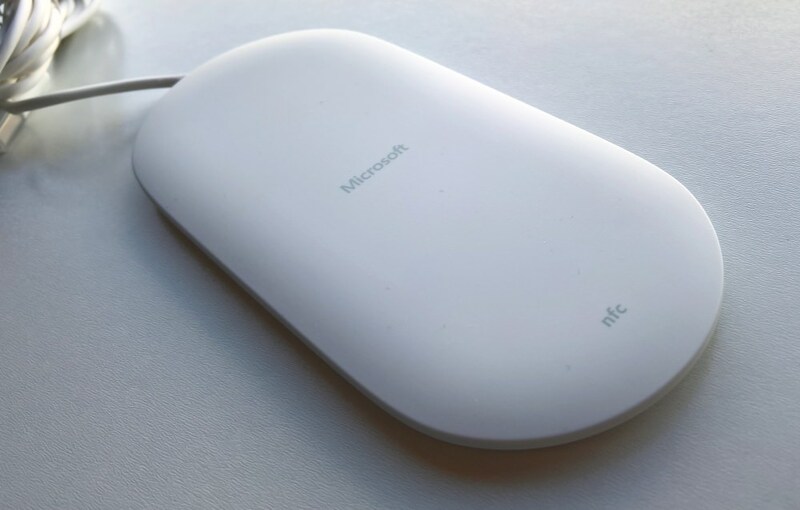 The top of the DT-904, here shown protected by a transparent plastic slip from the factory, is an off-white polycarbonate - note the NFC hotspot near one end - this and the Microsoft logo are printed on the charger itself. There's a (chunky) flying lead off to a USB-A connector and that's it - there's no mains adapter. It's assumed that you'll have your own high current (1.5A is needed, ideally) USB sources. In my case from a 5-port mains charger but you've probably got your own set-up too. 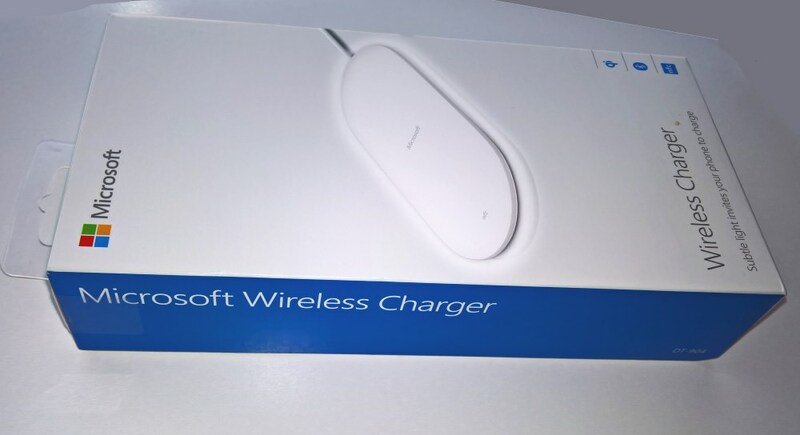 Mind you, for the best part of £50, I'd have hoped that Microsoft would throw in a mains charger of their own and I can only think the omission is due to wanting to ship this accessory, as-is, across all regions, languages and mains formats. 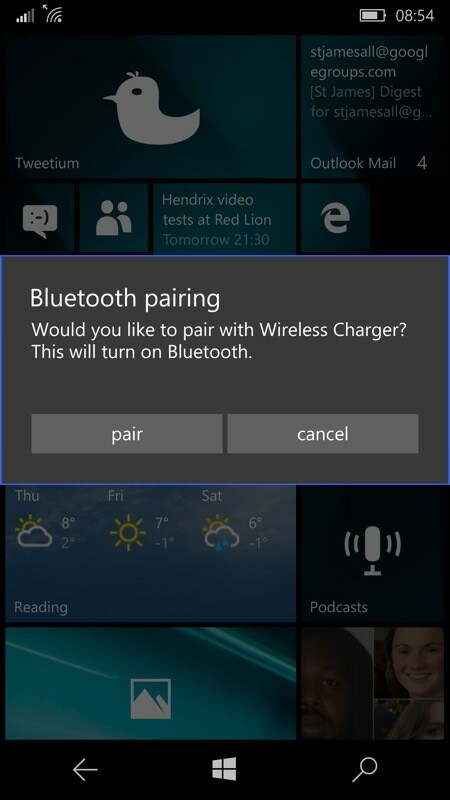 The LEDs obviously kick in while charging is taking place - and then extinguish when charging is complete - but Microsoft has coded some tricks into its mobile OS to take the accessory further. 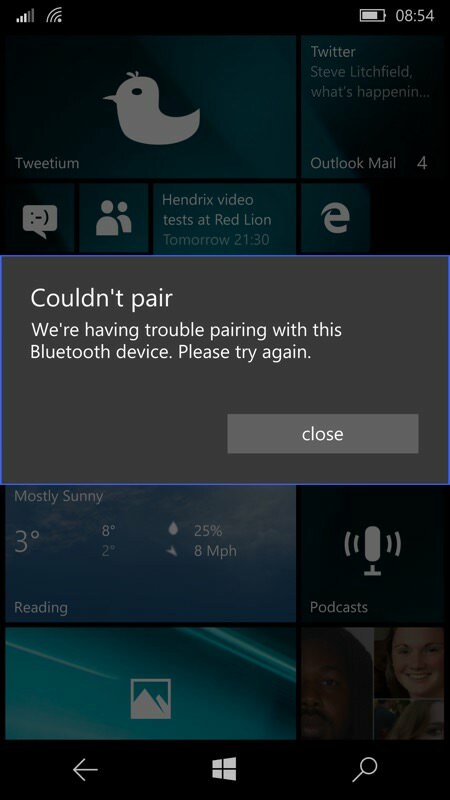 Note, by the way, that Gadgets also exists these days on Windows Phone 8.1, at least for anything running the 'Denim' firmware onwards. The advantage of the Bluetooth pairing is that all sorts of interesting information can be passed between the phone and accessory, with the LEDs the main conduit for notifications to the user. 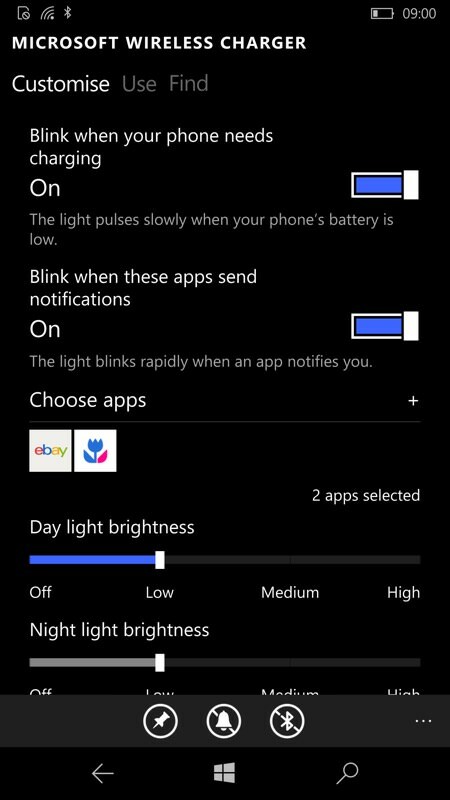 The screenshots below tell you most of what you need to know - should your phone get into the 'Battery saver' zone, Gadgets will tell the DT-904 to start blinking - a nice visual clue on your desk to pop your phone on the charger. Though not a lot of use when your phone's out of power while out and about, of course! Still, a nice idea, and why not? There's also the chance to customise the LED brightness and for day/night profiles, again as shown in the screenshot above, left. Typically you'd have this cranked up a bit in the day and set to 'low' at night, acting as a gentle night light in the bedroom, for example. But it's very much up to you. Any brightness changes are synced over to the DT-904 via Bluetooth in a matter of a second or so. Ultimately though, the DT-904's LED functions are possibly less important that it simply being a damn good Qi charger, with good looks and a large charging platform that's not too fussy about exactly how precisely you put a phone down on it. 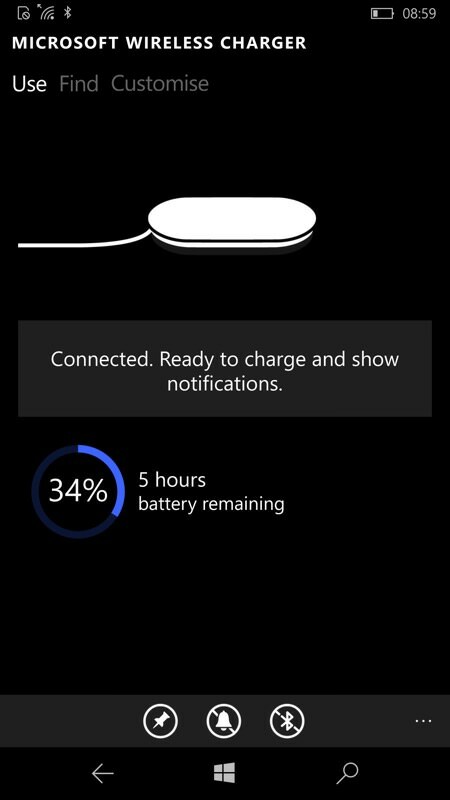 Even my very fussy Google Nexus 6, with rather small Qi coil, seemed happy to charge over a couple of inches of the DT-904's surface - and the Qi-compatible Lumias had no issues at all, even when the phone was deliberately misplaced by an inch. 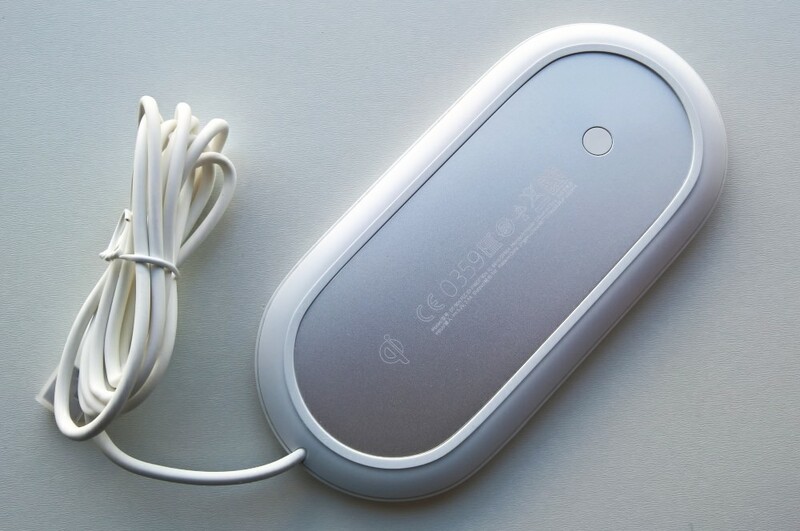 Thanks to Mobile Fun for supplying this DT-904 Wireless Charger. 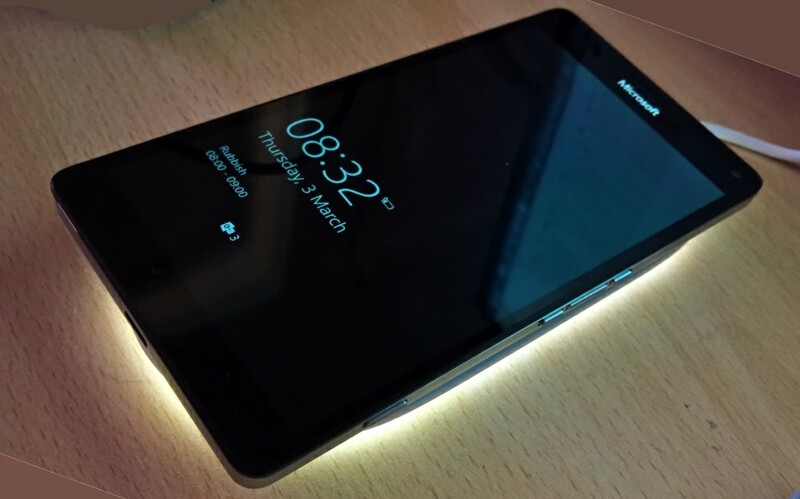 It's not the cheapest option out there, but it does offer something different if your Lumia is compatible and is worth seeking out.